Many production processes require an extended linear and absolutely even distribution of air or other gases over a certain area. The special design of LTG High Performance Tangential Fans provides the optimum solution for these requirements. The robust design and the use of high quality materials assure a long life expectancy. The way these fans work, allowing even air distribution without additional baffles and vanes, and the spacesaving design, make the use of tangential fans very economic. In a tangential fan, the air is drawn in over the entire length of the fan impeller. Inside the impeller, the airflow is diverted and accelerated by the vortex created by the rotation of the impeller. 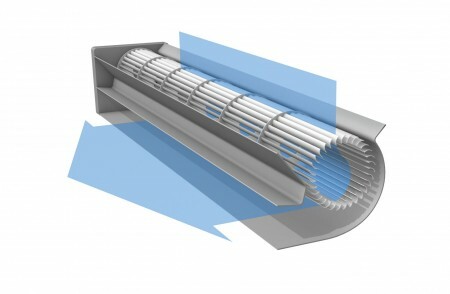 The airstream then exits over the entire length of the impeller on the discharge side. The vortex separates the intake and discharge side of the fan at the narrowest point between the impeller and the vortex builder. Together with the fan scroll, the vortex directs the airflow. This results in an almost uniform laminar airflow over the entire outlet width of the fan. In various industries, tangential fans provide effective cooling, heating or drying. This assures a flawless function and quality improvement of machinery and equipment. The specific design of the tangential fan saves space and provides the designer with a lot of freedom during the design process. Complicated additional air guidance Systems, such as ducts or guide vanes to optmise the air or temperature distribution, are not required. The whole assembly can be produced smaller, more compact, saving a lot of space. 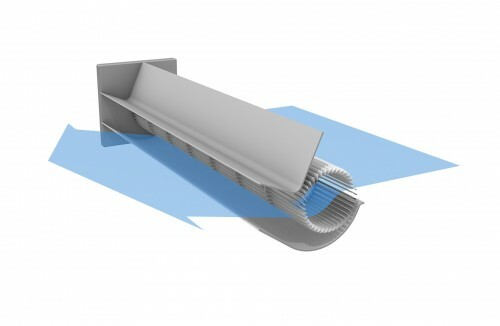 Space-saving installation due to 90° and 180° airflow pattern. Fan length can be matched exactly to machine width. Airflow conditions remain the same even for wider machines (simplified design and drafting in case of modular systems). Fans perform well in any mounting position. Drive can be mounted on right or left hand side. Quiet operation due to optimised impeller and housing design. Long life expectancy due to robust design and location of bearings outside the hot air zone. Explosion-proof models according to ATEX available.